If you're looking for punch and firepower, then the 4.5in main gun delivers. It can be found on all the Royal Navy's destroyer's frigates and destroyers and has pounded the enemy from the Falklands to Iraq. 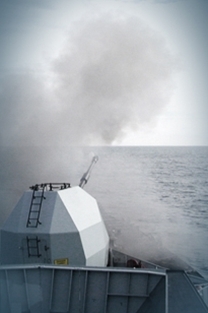 The 4.5in main gun, found on the forecastle of all the Royal Navy's destroyer's frigates and destroyers, is the most obvious provider of punch and firepower. Even in an age of missiles, there's still a need for a weapon to pulverise enemy positions and demoralise the foe - and the 4.5in gun has done so in the Falklands and Iraq. The gun can fire up to two dozen high explosive shells weighing more than 40kg (80lbs) at targets more than a dozen miles away - and nearly 18 miles if special extended-range shells are used. In various forms, the 4.5in has been the Navy's standard medium gun since before World War 2, embodied today by the Mk8 which has been in service since the early 1970s. There are two types of Mk8 used by the Fleet. The older Mod 0 (with its curved turret), which is gradually being replaced, and the angular Mod 1 (nicknamed Kryten after the robot on the sci-fi sitcom Red Dwarf) which is harder for enemy radar to pick up. The main purpose of the gun is Naval Gunfire Support – artillery bombardment of shore targets. In this role the gun is capable of firing the equivalent of a six-gun shore battery. The Mk8 can also be used effectively against surface targets at sea.